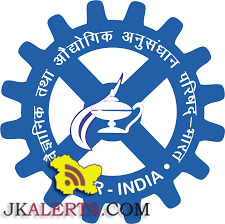 CSIR-Indian Institute Of Integrative Medicine CSIR IIIM Jammu Jobs Recruitment. 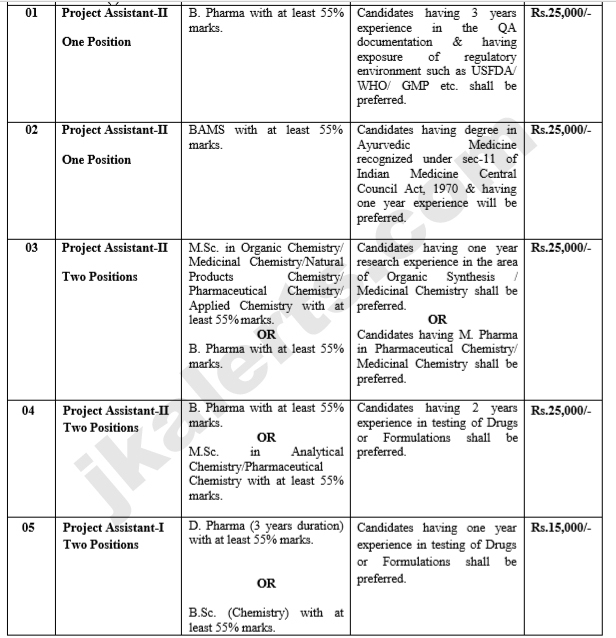 In recently official jobs notification for PROJECT ASSISTANT–I & II posts. All the interested and Eligible candidates can apply on the application form submitted duly filled on the day of interview between 9.00 A.M. to 10.00 A.M. Jkalerts will provide you the complete detail about this J&K Govt job notification like Eligibility criteria, How to apply Online, Important dates, Age limit with relaxation, post by category, Selection process & official notification. So interested candidates are requested to read it carefully to apply CSIR IIIM Jammu J&K. Time of Interview 10.00 A.M. Eligible candidates can attend the Walk-in-Interview along with complete bio-data in the prescribed application form (to be downloaded from the CSIR-IIIM Website attached with the advertisement) duly filled-up and signed and enclosing therewith self attested photocopies of certificates/testimonials in support of Date of birth, Educational Qualification, Experience, Caste, Domicile Certificate etc. and one latest passport size photograph duly affixed at the appropriate place in the application form. Tentative Mark sheets/Certificates and ‘RESULT AWAITED’ will not be considered. Candidates must also bring original certificates/testimonials along with them, for counter verification of the enclosed photocopies with the submitted application form. Eligible candidates are requested to be present at the venue on the said date ONE HOUR BEFORE the scheduled time of interview [i.e. Candidates are supposed to arrive at the venue of interview ON OR BEFORE 9.00 A.M.] for necessary verification of documents. Candidates will not be entertained after 10.00 A.M. under any circumstance. Through Interview. However, if large number of candidates turn up, a Screening test comprising of Multiple Choice Objective Questions (MCQs) will be held for short listing the candidates for interview. The short listed candidates will be interviewed by the Selection Committee and, based on the performance in the interview; a panel of recommended candidates will be formed. The panel shall be utilized as and when the requirement arises in the projects in the relevant field/area. Candidates have the option to interact in Hindi/English before the committee. In case turning up of large number of candidates, interview may continue for next day. The positions are purely temporary on contract basis and co-terminus with the CSIR/Sponsored projects. In case the final certificates reflect CGPA/SGPA/OGPA Grades etc., in that case the candidate should convert the same into equivalent percentage as per the approved formula of the university in the application and a copy of such conversion formula must be attached along with the application. HRA will be applicable as per availability of funds in the respective projects. To avoid any inconvenience, only those candidates who strictly fulfill the eligibility criteria and possess the degrees/mark sheets in the aforesaid subject should turn up for walk in interview. Application Form can be downloaded from CSIR-IIIM website: www.iiim.res.in and submitted duly filled on the day of interview between 9.00 A.M. to 10.00 A.M.
WALK-IN-INTERVIEW for Project Assistant -I & II on 21.08.2018. Download Application Form. WALK-IN-INTERVIEW for Project Assistant – II on 20.08.2018. Download Application Form.